The door bell rings and I find a chap complaining to me about a roundabout a couple of miles up the road. I guess it's his way of saying, “Sorry, I'm late”. However, I'm a forgiving sort of person especially when I see he has a hamper of extremely nice goodies from Applewood Cheese. I've been a fan of Applewood Cheddar for some years and now it is available in a spreadable version. In order to spread the word (see what I've done there?!). 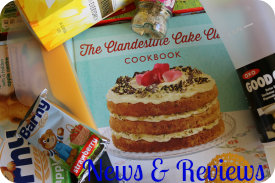 Applewood have been asking bloggers to conjure up recipes using some of the products as inspiration. So this is a simple and filling pasta dish which is quick to make. Perfect for when you are in a hurry because your delivery driver turns up late. 1. Put the olive oil in a large frying pan and sauté the onions and pancetta until the onion starts to soften. 2. Add the peas and continue cooking for a couple of minutes on a low heat. 3. Meanwhile cook the spaghetti in boiling water. It should only take about four minutes. 4. Add the Applewood Spreadable with 4 tbsp (60ml) of the spaghetti cooking water to the pea and pancetta mix. Stir well. 5. Drain the spaghetti and stir through the Applewood pea and pancetta mixture. 6. Serve immediately – it will go cold quick! Replace the olive oil for vegetable or sunflower oil. Instead of pancetta use lardons or dice some thick bacon. Cooking bacon works well for this. Use dried spaghetti or other pasta of your choice. Dried takes longer to cook so put it on to cook at the beginning. Applewood sent me the items for free. No payment was made for this post. Recipe, photos and words are my own. 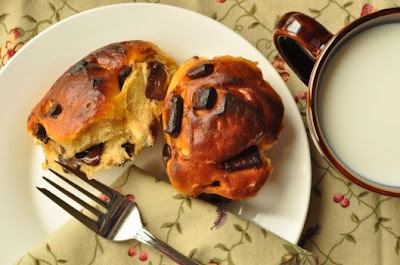 At the beginning of October I asked you to bring in the harvest for me and combine vegetables with chocolate for this month's We Should Cocoa founded by Choclette of Chocolate Log Blog. Thank you to Choclette for letting me loose and a big thank you to everybody who took part and came up with so many varied recipes. Without anymore gushing here's the round up of October's fine spread. First entry in was from Suelle at Mainly Baking. She used a recipe from The Good Food Channel for her Sweet Potato and White Chocolate Cake. Suelle took their advice and added some orange zest for extra flavour plus some dark chocolate to finish it off. The gloom of a wet Sunday in Lincolnshire inspired Dom at Belleau Kitchen to mix dark chocolate with carrots for his Chocolate Carrot Cake. This recipe makes enough for two small loaf cakes and four muffins. The founder of the We Should Cocoa Challenge Choclette of Chocolate Log Blog went in search of vegetables at her allotment and came back with a glut of beetroots. 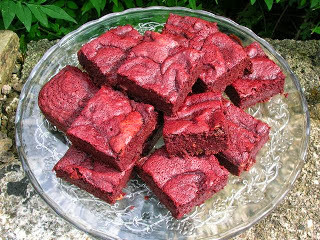 Check out the amazing natural colour of her Beetroot and Orange Brownies. Over in New Zealand Lucy of The Kitchen Maid got distracted by a house renovation reality TV programme and ended up baking a brick. 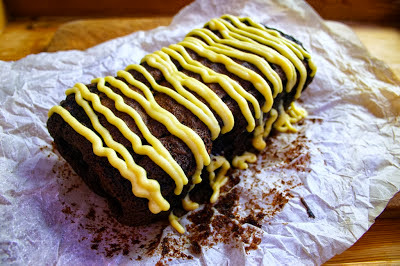 However if you concentrate and follow her recipe you'll be rewarded with a delicious Chocolate Beetroot Banana Bread. Back to Blighty for our next entry and a hop over the Pennines for me to Linzi at Lancashire Food. 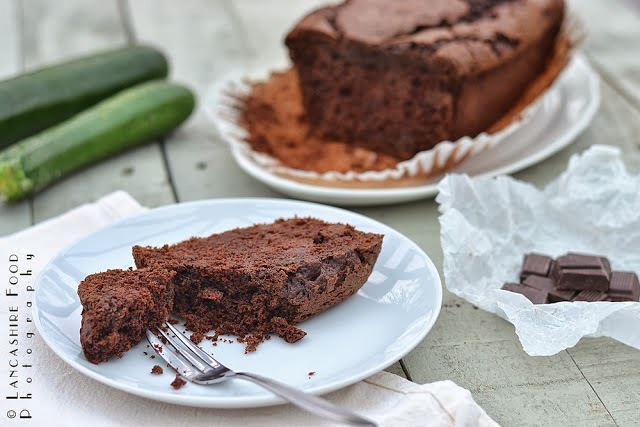 Her tried and tested recipe for Chocolate Courgette Loaf has the Green and Black's seal of approval as they published it their book Unwrapped. Vicky at YumYumBubblegum made us something that was definitely yum yum but had no bubblegum in it. Instead her Chocolate and Ginger Cake had a secret and rather sneaky addition of courgette. Some of the best recipes are the ones you cook from ingredients you need to use up. 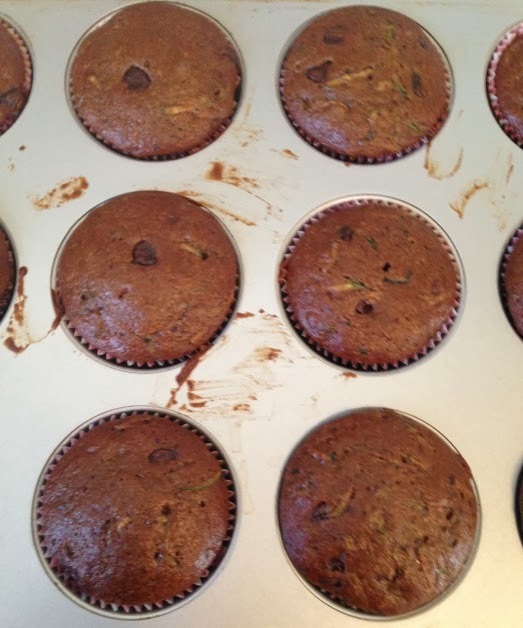 This was proved by Elizabeth at The Law Student's Cookbook with her Chocolate Zucchini (Courgette) Muffins. She was wanting to use beets and found she didn't have any so zucchini it was then. These are also eggless for the same reason! This month's theme of cooking with vegetables and chocolate was like the mothership coming home for Kate of Veggie Desserts. 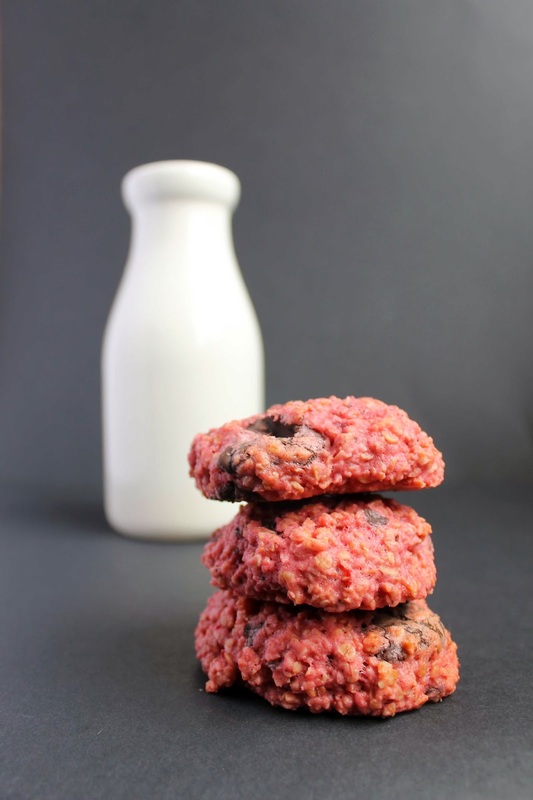 Although she already has a number of delectable choc & veg combos on her blog she treated us to new recipe of Beetroot Chocolate Chunk Cookies. If there's a food blogger's challenge about vegetables it is only right we should have an entry from Louisa at Eat Your Veg. 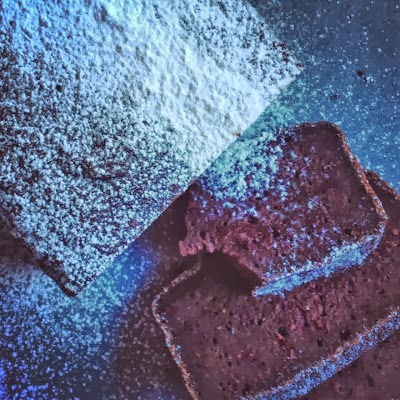 Sneaking vegetables into recipes so your kids don't notice them and like them can be a daily struggle but her much tested Chocolate, Beetroot and Walnut Brownies fooled her children. 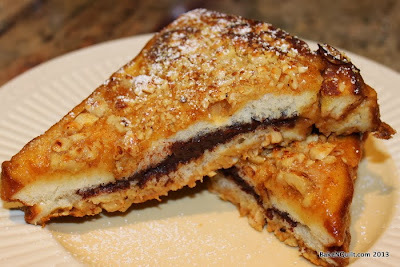 It was time for breakfast over at Rebecca's blog BakeNQuilt. Inspired by a favourite B&B of hers Rebecca's autumn staple food of pumpkin found its way into her Nutella-Stuffed Pumpkin French Toast. It wasn't just one vegetable that went into Laura of I'd Much Rather Bake Than... cake but two plus a whole host of fruit as well. 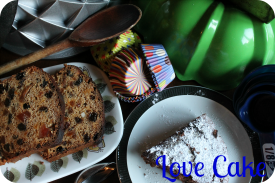 Her aptly titled Fruit and Veg Cake had enough ingredients to make up our 5-a-day which meant we could be treated to a white chocolate topping. We went for afternoon tea with a twist with Shaheen from Allotment 2 Kitchen. 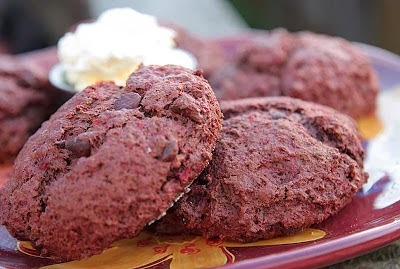 Her Chocolate Beetroot Scones had a beautiful natural colouring to them and still went great with lashings of whipped cream! I've never made blondies before but I'm definitely tempted by Natalie's version. 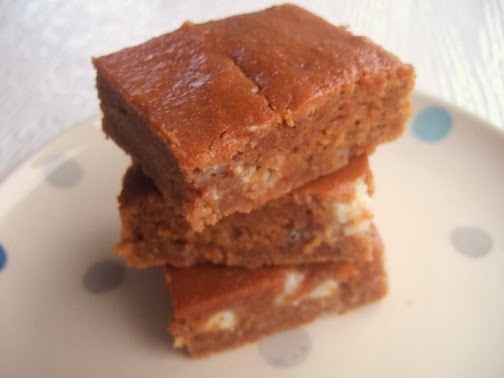 The Hungry Hinny that she is presented us with some very seasonal Autumn Spiced Butternut Blondies. Sweet buns can be very tricky to make but help is at hand with Alexandra of The Lass in the Apron. Her step-by-step photographs of Sweet Potato Chocolate Buns means everybody should be brave enough to give them a go. 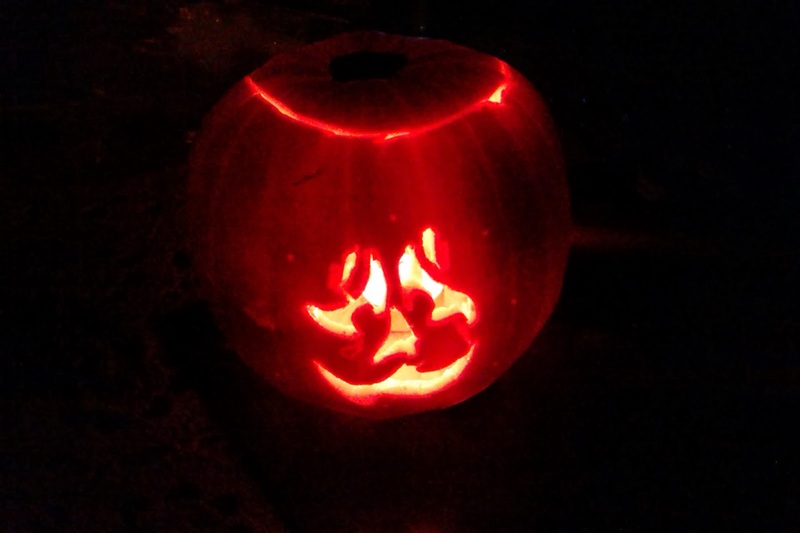 The witching hour is almost upon and October means Halloween and pumpkins and Caroline of Caroline Makes... came up trumps. Two different layers, bats, ghosts and a skeleton; this was the ultimate Halloween cake. There's definitely a nip in the air now and I'm a big fan of soup to warm the body and soul. 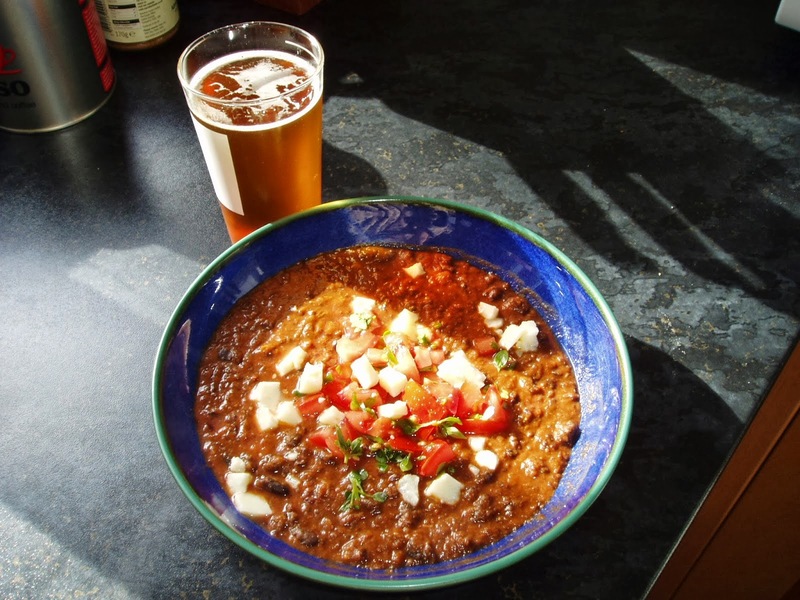 Jill of Lapin d'Or and More gave us her take on Dennis Cotter's Black Bean Soup with Chocolate Chilli and some handy foodie shopping tips. So it is left to me as your privileged hostess of October's We Should Cocoa to finish the month off as it began. I kicked things off with a Chocolate and Potato Cake with cranberries and macadamia nuts. The addition of the leftover mashed potato gives a moistness to the cake. 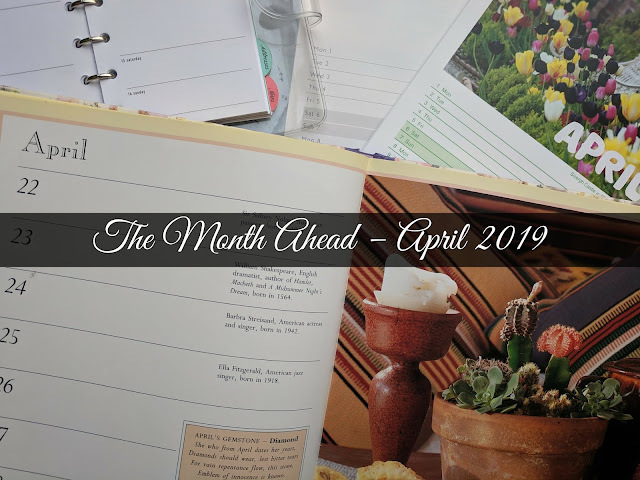 If you joined in this month or fancy taking part in next month's We Should Cocoa then head over in early November to Rebecca at BakeNQuilt to find out the theme. In the meantime happy baking and making and I hope you got some inspiration from this month's tasty delights. Forget pumpkins this Halloween - it's all about the fruit! The act of pumpkin carving at Halloween has long been a tradition in North America since the 19th Century. Over the years the UK has embraced the notion of dressing up as witches, vampires and ghosts and searching out a house with a lit pumpkin in the hope of being given treats. Turnips, swedes and beets are also sometimes used for Halloween lanterns but by far the most popular choice is the big orange squash. The size of a pumpkin makes it so effective as a beacon on a cold, dark night. The bright orange colour reflects how autumn changes the colours in nature. Whilst vegetables may be the first thought for Halloween carvings fruit can work just well. With this in mind it didn't take much persuading when the the lovely people at Alex and Alexa suggested we should enter their Spooky Fruit competition. Miss JibberJabber got to work and came up with this design. The original Spooky Fruit design! It centres around a watermelon with an apple for a scary face. Really I think this was just a devious way to get a watermelon in the house as I'm not that keen on it but she loves it. Although we may never be awarded any commissions based on our sculpturing skills a lot of fun was had in the planning, designing, shopping and finally creating of our Spooky Fruit. The final version had the addition of grapes for eyes, carrot peelings for hair and some white chocolate covered ghouls as helpers. While they maybe Spooky Fruit I have to sadly report that all the fruit came to a rather tragic end as it was eaten alive! This is a post for Alex and Alexa Spooky Fruit Blogger Competition. No payment was made for this post and the designs were my seven year old daughter's. 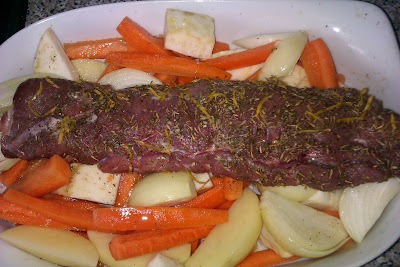 I've mentioned on his blog several how we like to have a roast dinner every Sunday. This can be a variety of meats but the stipulation is that the meal must include a decent slab of meat and a selection of vegetables to go with. Usually the meat is roasted in a large tray and the potatoes are cooked in the juices around it. This is fine if the meat has its own fat but sometimes this isn't possible as in the case of a pork tenderloin fillet (fear not Thrifters, it was reduced). To combat this and to keep the pork moist I find the best way to cook it is by roasting it in stock with all the vegetables around it. This also very handily saves on the washing up as well! The addition of the herb and lemon zest crust is an easy way to give the dish a bit more flavour. Equipment: Large oven-proof dish or roasting tin. 2. Put all the vegetables in a large oven-proof dish or roasting tin. Pour over the olive oil over and mix together to make sure they are all coated. 3. In a small bowl mix together the lemon zest and herbs. Spread onto a plate and then roll the pork in it so it covers the pork. 4. Put the pork on top of the vegetables and cook for 40 minutes. 5. Spread the apple evenly over the pork and vegetables. 6. Pour the stock over the vegetables – not the pork or the herbs will wash off. 7. Cook for a further 15 minutes. 8. Slice the pork and serve with the roasted vegetables and stock. If you want just before serving you could thicken the stock mixture with cornflour. Tottenham Cake makes an easy tea-time traybake. You never can tell when the weather is going to change at this time of year. Bright, sunny mornings can turn into downpours just after you put that second batch of clothes in the washing. So the when the sun does shine you need to be quick and get yourself organized – magnifying glass, net, tweezers, canister, bug barn, identification book and a selection of Barny snacks. That's all you need to go on a bug hunt! Autumn is a great time for looking for insects. In the summer most insects are of the stinging flying variety or the delicate, too pretty and fragile butterflies. Once we get into September and October it's time for the spiders to get busy. You won't need to go far for a bug hunt – town or country you'll be sure to find plenty in the bushes around where you live. We decided to go on a short walk to the local fields. There were only a few dog walkers about but human life was evident in the shouts of the Sunday League footballers and distance hum of the cars whizzing down the A3. A patch of tall grasses seemed an ideal place to start looking. It wasn't long before we found our first specimen. Eye spy with my little eye...another spider find. Resting on a blade we spotted a little black beetle. Lunch! We think it was a bee. All of finds were locked safely in our bug barn while we had a sit down. Time for a break and to find out what we had caught. Every creature needs to eat! Time to release our spiders before heading home. 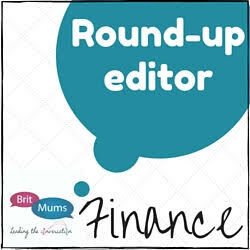 This is an entry for Brit Mums 'Little Adventures Challenge' in partnership with Barny, the bear-shaped snack providing a little discovery in every bite. Find out more about Barny here. I was sent the Barny snacks and bug hunt kit for free. No payment was made for this post. I took the plunge a couple of months ago and asked the lovely Choclette of Chocolate Log Blog if I could be the guest host of her monthly chocolate cooking challenge We Should Cocoa. To my delight she said yes so here we are for my first blogging challenge hosting. Last month's challenge was the third anniversary of We Should Cocoa and appropriately the theme was Chocolate Showstopper Cake. Last October we had pumpkins on their own for We Should Cocoa but if you missed that or have another recipe here's your chance. It's not just about the big orange squashes though. 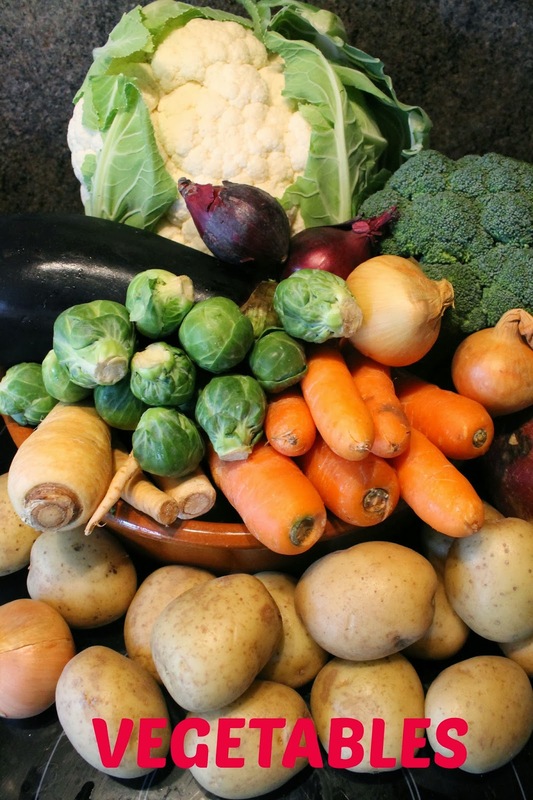 Make the most of the wonderful seasonal produce that is in abundance this year. If you grow your own it's time to show it off and bring me your beetroot. Got a great local market or producer? Shout out about their swede. While we're thinking about local and seasonal let's just have a word about ugly vegetables. Some veg may not be lookers but that's no excuse to throw them away. If you have some odd looking aubergines or seen better days butternut squash I want to see what you have made with it. To kick things off I've made a Chocolate and Potato Ring Cake using some leftover mashed potato. This goes to show that vegetables are a great ingredient to combine with chocolate. This year I've the pleasure of eating chocolate cakes made with aubergine and beetroot. It's not just about cake. You can keep it sweet or make it savoury just make sure your recipe includes chocolate and at least one vegetable. Post your recipe on your blog. Remember, we all love a photograph too whether it's lovingly styled or snapped on your mobile, show us what you have made. Link your recipe by the 25th October to the linky below. Please link to me, JibberJabberUK, as this month's host and also Choclette at Chocolate Log Blog. 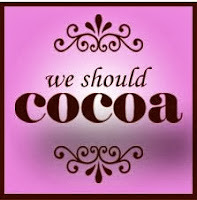 Please use the 'We Should Cocoa' logo in your post. If you use Twitter please tweet your post to @jibberjabberuk and @Choclette8 with the hashtag #weshouldcocoa and we will endeavour to retweet it. Please make sure you use this month's ingredient of vegetables and chocolate in your recipe. A round-up of all your fabulous creations will be posted on JibberJibberUK after the closing date. For any further details please look here. Chocolate and Potato Cake with the addition of macadamia nuts and dried cranberries. I've been blogging for a bit now and enjoying the cooking challenges that are hosted by other bloggers. Often challenges are guest hosted by other bloggers giving them a chance to pick their own themes. I thought it was time that I stepped up to the plate and put myself forward as a guest host. 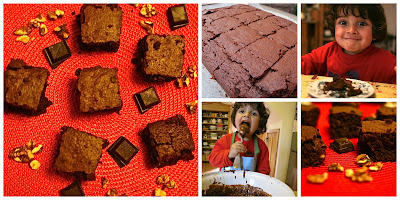 Since I always have a very willing band of chocolate recipe testers I thought I would ask Choclette of Chocolate Log Blog to be a guest host of her We Should Cocoa chocolate cooking challenge. Happily, she agreed and for October 2013 I decided the theme should be vegetables. So here's my contribution for the We Should Cocoa challenge. One question that may well be asked is why the inclusion of the mashed potato? Firstly, it's a terrific way of using up a little bit of leftover mashed potato. Secondly, the addition of the mashed potato adds a moistness to the cake. Quite often when cocoa is added to a recipe it can have a drying effect. I've also added some macadamia nuts and dried cranberries. Substitute these if you wish. Chopped almonds, walnuts, raisins or sultanas would all work equally well. I've left it plain this time but an icing topping, either plain or chocolate, is also welcome. Equipment: 1½ pint (900ml) Ring mould or savarin tin (mine's from Lakeland), electric whisk. 1. Grease the ring mould. 3. Sift the flour and cocoa together. 4. In a separate bowl cream together the butter and caster sugar. 5. Beat in the eggs one at a time, adding a little of the flour/cocoa mixture. 6. To remove any lumps from the mashed potato put through a ricer or press through a sieve. 7. Stir the mashed potato, macadamia nuts and cranberries into the creamed mixture. 8. Fold in the flour and cocoa into the tin and cook for 35 minutes or until a skewer comes out clean. 9. Leave in the tin for a few minutes before turning out onto a wire rack to cool.